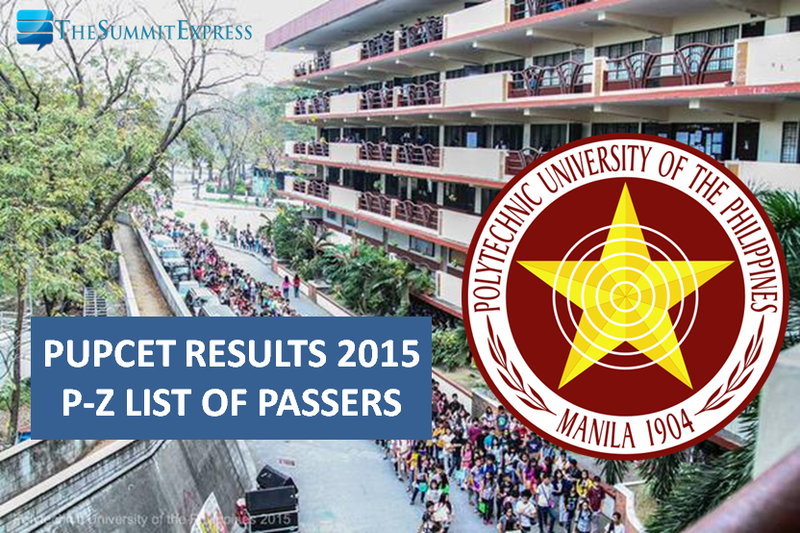 MANILA, Philippines - Takers of November 29, 2014 and February 7, 2015 Polytechnic University of the Philippines (PUP) College Entrance Test (PUPCET) may now check on this page the full list of passers and waitlisters as the premier university officially released results online today, March 10, 2015. PUP Communication Management Office said that for academic year 2015-2016, there has been an annual increase in the number of PUPCET applicants and examinees under the administration of PUP President Emanuel C. De Guzman. More than 40,000 graduating high school students took the PUPCET last November 29 (first batch) and a total of 21, 2019 for February 7 (second batch) in Sta. Mesa Main Mabini Campus. Note: Online confirmation will start on March 12, 2015. For inquiries, please call the the PUP Admission Services at 335-1798 to 99. On March 6, PUP has shared online the target release date of PUPCET results to ease the agony of waiting on the part of the examinees. PUP Main advised that each campus has an allotted specific date to show the list of its successful examinees. Confirmation of slot and schedule of application are done through the university's website, and failure to confirm slot may result in the cancellation of admission to the campus.